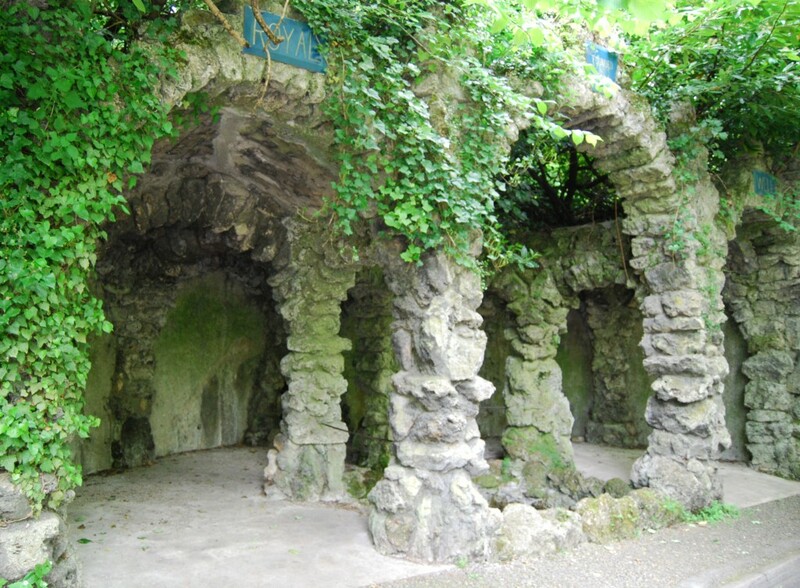 When I put together the Derbyshire Taking the Waters: the history of spas & hydros tour, I made a point of including some of the obscure, rarely noticed relics of the ancient custom of using natural springs for therapeutic purposes. 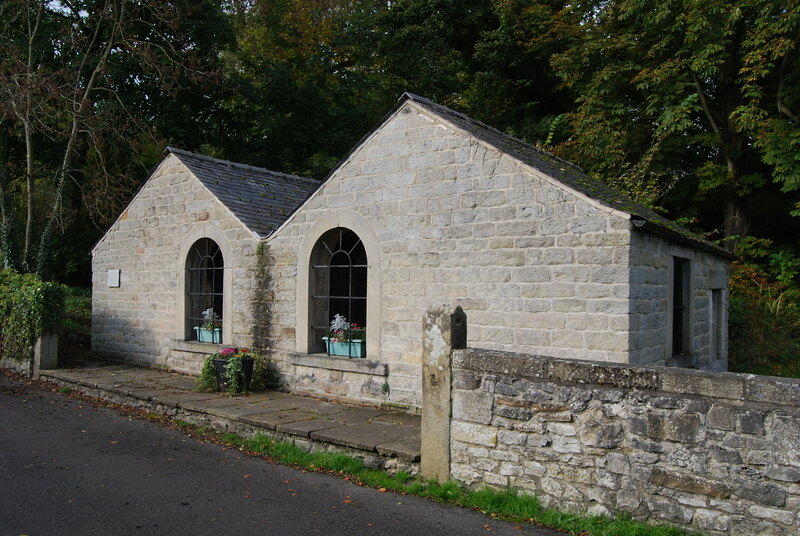 The village of Stoney Middleton has twin bath houses, hidden behind the parish church. They were built by the local landowner, Thomas Denman, in 1815. Before that, according to James Pilkington, in his A View of the Present State of Derbyshire (1789) the baths were open to the elements and “discouraging”. 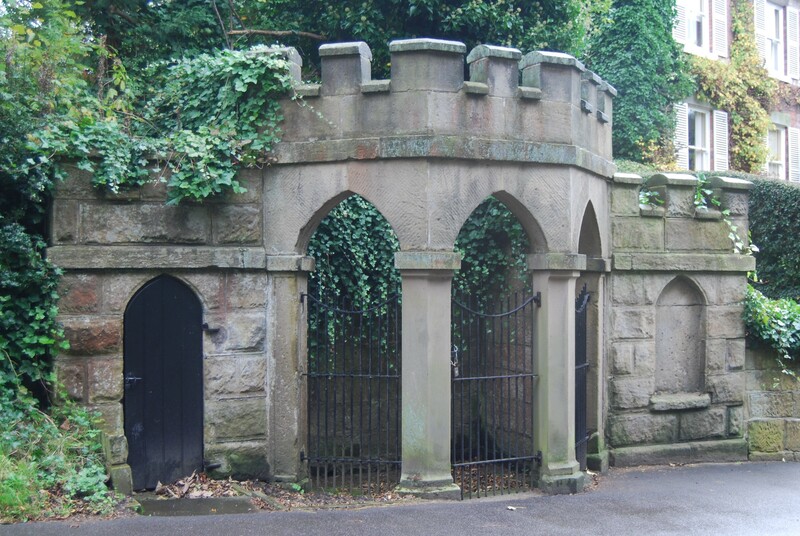 Denman provided male and female baths and changing rooms, complete with fireplaces. That must have counted as luxurious in the wilds of Derbyshire in the time of Jane Austen and Charlotte Brontë. 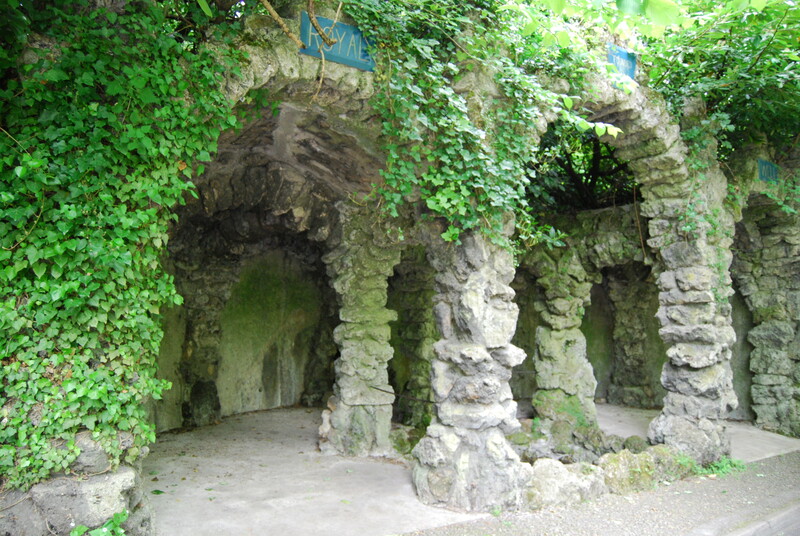 Nowadays they are used for an associated purpose: restored in 1985-92 by the parish council, they provide storage for the village’s well-dressing team. This entry was posted in Fun Palaces, Taking the Waters: the history of spas & hydros – Derbyshire on January 22, 2014 by Mike Higginbottom. Any modern tourist resort needs a car park. A Victorian resort needed a railway station. In the days of coach-travel, stables were essential. 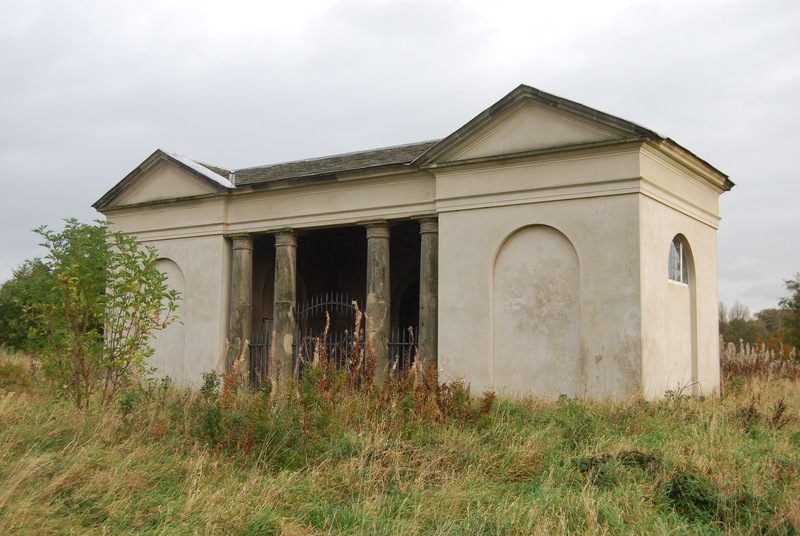 When the 5th Duke of Devonshire developed the spa at Buxton, he commissioned the architect John Carr of York also to build a commodious stable block on the hill at the back of the Crescent (1780-90). 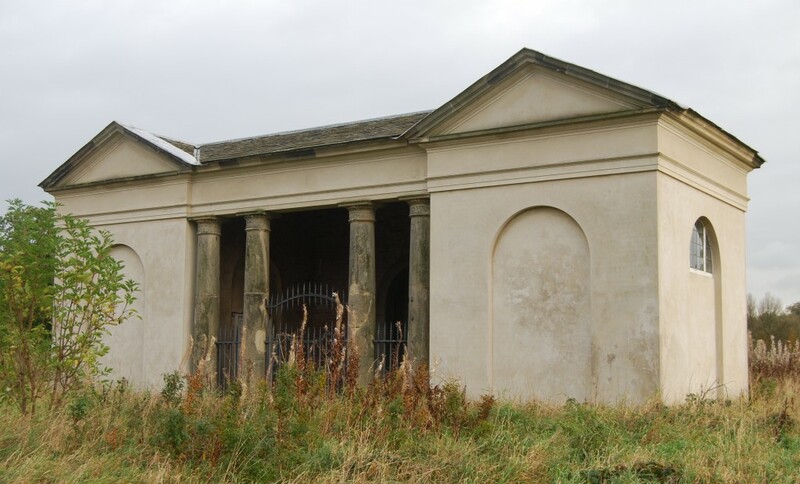 The Stables (1785-1796) was a huge octagonal building accommodating 110 horses and sixty coaches, with a circular covered gallery around the internal courtyard for exercising. Ostlers and grooms were accommodated above the horses, to take advantage of their body heat. On top of the capital cost of the Crescent – £38,601 18s 4d – the Stables cost the Duke a further £40,000. The imminent arrival of the railway in 1863 indicated that the Stables would soon be redundant, and the Seventh Duke allowed two-thirds of the building to be converted by the Buxton Bath Charity “for the use of the sick poor” by the Chatsworth estate-architect Henry Currey in 1859. 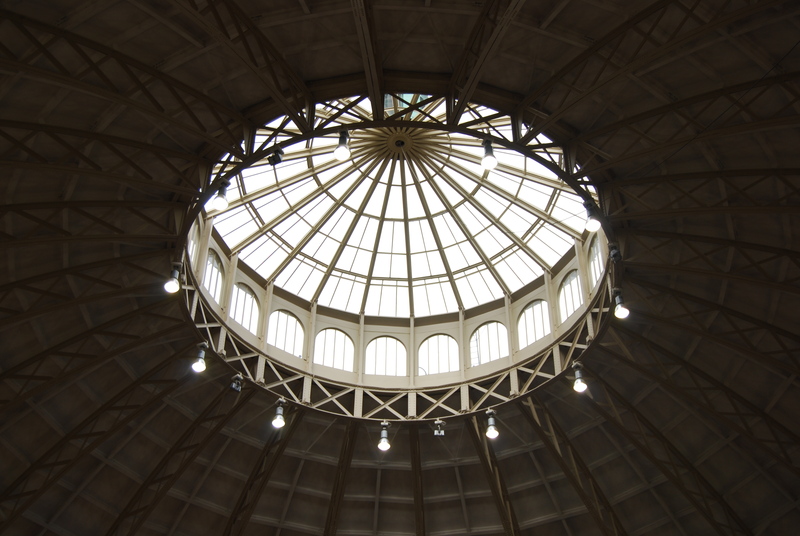 Subsequently the courtyard was enclosed in 1881-2 by the superb 156ft-diameter dome – the largest in the world at the time of construction – by the Buxton architect Robert Rippon Duke (1817-1909). Robert Rippon Duke is one of those minor Victorian architects who never made a national reputation, but stamped his identity on a particular locality. His life is chronicled in an admirable biography by Mike Langham & Colin Wells, The Architect of Victorian Buxton: a biography of Robert Rippon Duke, “the Duke of Buxton” (Derbyshire Library Service 1996). 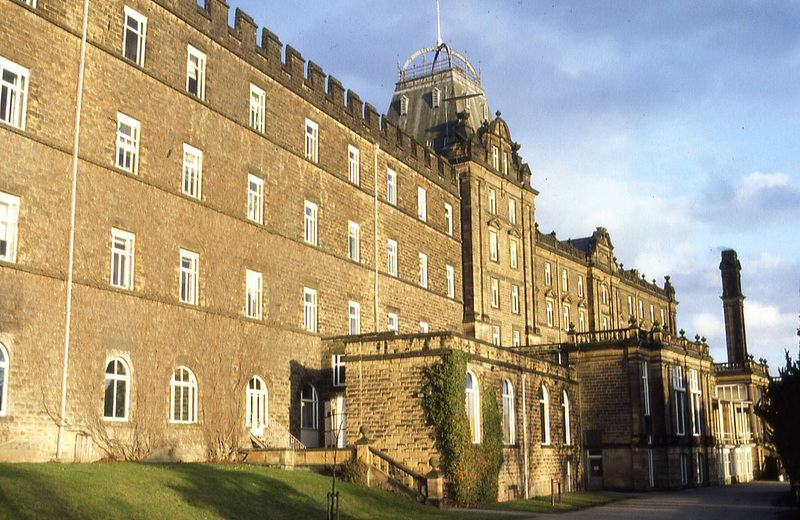 The hospital was renamed the Devonshire Royal Hospital in 1934, and continued to offer hydropathic treatments until 2000. After it closed, the University of Derby took over the site, restored and converted the building as reopened it as the Devonshire Campus in 2003. 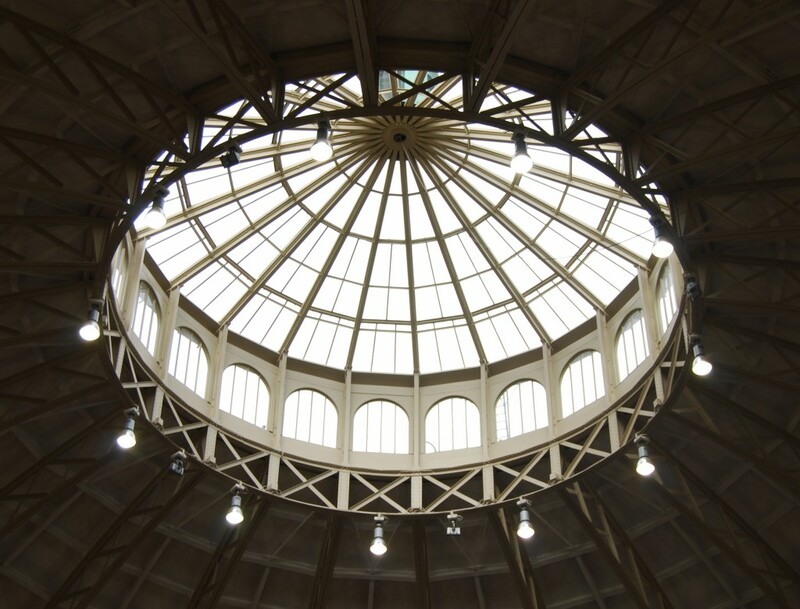 The dome is open to the public and, because the campus houses the faculties of hospitality and what are described as culinary arts, there’s always a cup of coffee to be had at Bistro 44 – http://www.derby.ac.uk/thedomefinedining/bistro44.asp, and serious food at the Fine Dine Restaurant – http://www.derby.ac.uk/thedomefinedining. Be sure to book. This entry was posted in Fun Palaces, Taking the Waters: the history of spas & hydros – Derbyshire, The Derbyshire Derwent Valley, Victorian Architecture on January 7, 2014 by Mike Higginbottom. The major health-resort of the Roman Empire was Aquae Sulis, which we know simply as Bath. The second most important was Aquae Arnemetiae, high in the bleak Derbyshire hills, which is now the town of Buxton. 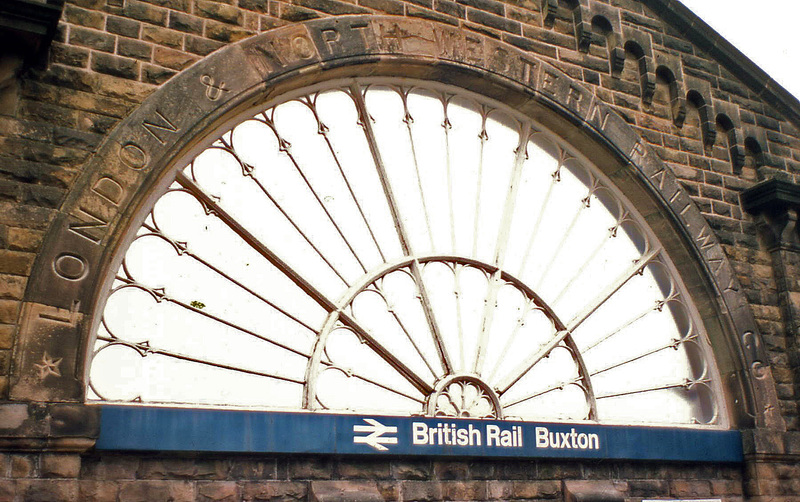 Whereas the spring-water of Bath steams at a temperature of 116°F, Buxton water is comparatively tepid at 81-2°F. If you’re in Buxton, you don’t have to buy the stuff in a bottle; you can simply fill your flask for free at St Ann’s Well opposite the Crescent. The fifth Duke of Devonshire (1748-1811), taciturn husband of the effervescent Georgiana (respectively played by Ralph Fiennes and Keira Knightley in the film The Duchess, 2008), reputedly used a single year’s profits from his copper-mine at Ecton, Staffordshire, to set up Buxton as a rival to Bath. He employed the architect John Carr of York from 1780 to 1790 to build a crescent of hotels and lodging-houses, resembling John Wood II’s Royal Crescent at Bath. Whereas John Wood had the advantage of an eminence overlooking the Avon valley and sufficient space for his expansive half-ellipse of thirty residences, Carr had to incorporate the thermal spring on a cramped site at the bottom of a steep hill. Carr made the best of it, and designed a semicircular crescent with an arcade that offers protection in a town that famously catches the worst of the weather at every season. Because of its low-lying position, the building is visible from all angles, especially by arriving travellers, so the cornice continues right round the building, hiding all the roof features except the cruciform chimney-stacks. From no viewpoint is it apparent that the two return blocks are asymmetrical: the east wing has seven bays, while the west has only five. The wedge-shaped lodging houses are arranged with three storeys facing into the Crescent and four behind, so that the arrangement of rooms and staircases is curious and complex, to maximise the flexibility of accommodation for first- and second-class guests. 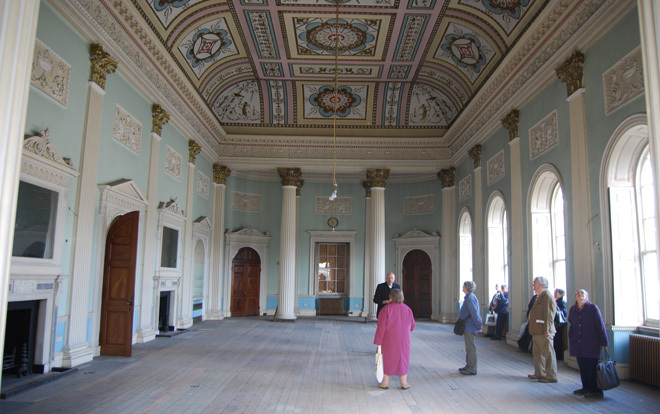 John Carr also gave Buxton, for the first time in its history, an imposing formal assembly room as part of the Great Hotel in the eastern pavilion. Carr’s command of three-dimensional planning challenged his masons: he was obliged to make a full-size model of the assembly room staircase which sits within the spandrel where the curved south wall joins the rectangular east wing. This beautiful Adamesque assembly room with plasterwork by James Henderson Jnr of York was, in the 1970s, beautifully restored as the local branch library, until it became clear that the weight of the books and bookcases was threatening the stability of the floor. The library was quickly removed, and from 1993 onwards the rest of the building gradually fell derelict. The whole exterior of the Crescent has been restored, but schemes to renew the interior and bring the building back into use have repeatedly stalled. The latest project is detailed at http://www.highpeak.gov.uk/hp/news/historic-agreement-paves-way-for-crescent-development. The Buxton Crescent has stood empty for too long. It’s a building that deserves to be enjoyed. This entry was posted in Fun Palaces, Taking the Waters: the history of spas & hydros – Derbyshire, The Derbyshire Derwent Valley on January 7, 2014 by Mike Higginbottom. 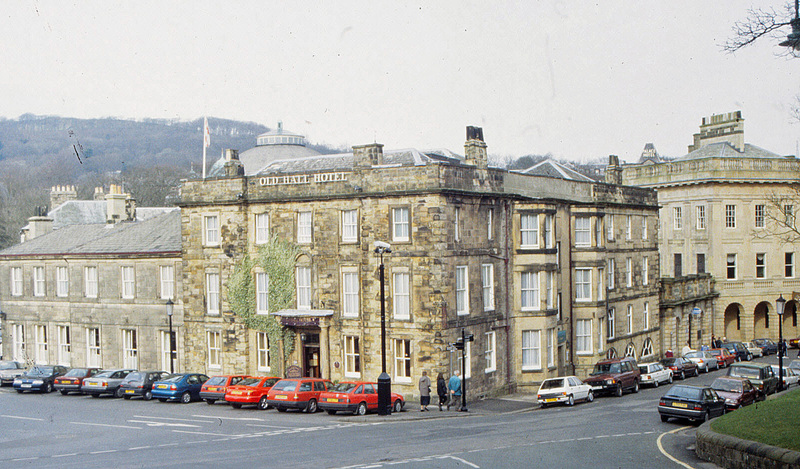 When I lectured to the Cavendish Decorative & Fine Arts Society in Buxton [http://www.cavendishnadfas.org.uk/index.html], I was taken for an enjoyable lunch to the Old Hall Hotel [http://www.oldhallhotelbuxton.co.uk], where the food was as excellent as the service was leisurely. I chose wild boar burger which, to be honest, tasted much like any other hand-made burger – very good indeed. The Old Hall is at the heart of historic Buxton. It stands on the site of the Roman bath and medieval holy well, and was constructed as a typical Midland four-storey high house [compare with North Lees Hall, Hathersage] by George, sixth Earl of Shrewsbury who recovered from an attack of gout after trying the “baynes of Buckstones” in 1569. It had a battlemented roof and contained a great chamber and lodgings for up to thirty guests. Here he entertained most of the greatest names in Elizabethan politics – Lord Burghley (1575), Robert Dudley, Earl of Leicester (five times between 1576 and 1584) and his older brother Ambrose, Earl of Warwick (1577). Queen Elizabeth herself never travelled this far north, but did receive a delivery of Buxton water, which gave her no benefit: it was said not to travel well. Lord Shrewsbury was the fourth husband of the formidable Bess of Hardwick and the custodian of the captive Mary, Queen of Scots, who stayed here nine times between 1573 and 1584. Caught between his domineering wife, the duplicitous Scottish queen and the volatile English one, he lived an unenviable life. Buxton Old Hall was substantially rebuilt in 1670 and again in the late eighteenth century, but its core survives within the present-day hotel, as becomes obvious when you move from room to room through thick walls and odd doorways. Needless to say, it’s much improved over the past three hundred-odd years. They take their time over the boar burgers, and the result is worth waiting for. This entry was posted in Country Houses, Fun Palaces, Life-enhancing experiences, Taking the Waters: the history of spas & hydros – Derbyshire, The Derbyshire Derwent Valley on January 7, 2014 by Mike Higginbottom.